Purchased by J. Pierpont Morgan (1837-1913) in 1911. Executed for a member of the Visconti-Sforza family (emblems and devices of both families found intermingled on the cards, i.e., the Sforza three interlinked diamond rings, the Visconti ducal crown of Milan with palm and laurel), probably Francesco Sforza (d. 1466), most likely after his triumphal entry as Duke of Milan 25 March 1450; Count Alessandro Colleoni of Bergamo (d. 1900); purchased by J. Pierpont Morgan (1837-1913) through Hamburger Frères, Paris, in 1911; by descent to J.P. Morgan (1867-1943). Tarot cards; 33 illuminated in Milan, Italy, ca. 1450, and 3 replacement cards (M.630.5 - Temperance; M.630.8 - Fortitude; and M.630.13 - The Sun) illuminated ca. 1480. Decoration: 8 court cards and 15 trump cards with figural representations, 12 decorated pip (numerical) cards. Artist: the three replacement cards have been attributed to Cremonese painter Antonio Cicognara; the remainder of the deck has been attributed variously to Bonifacio Bembo and Francesco Zavattari. 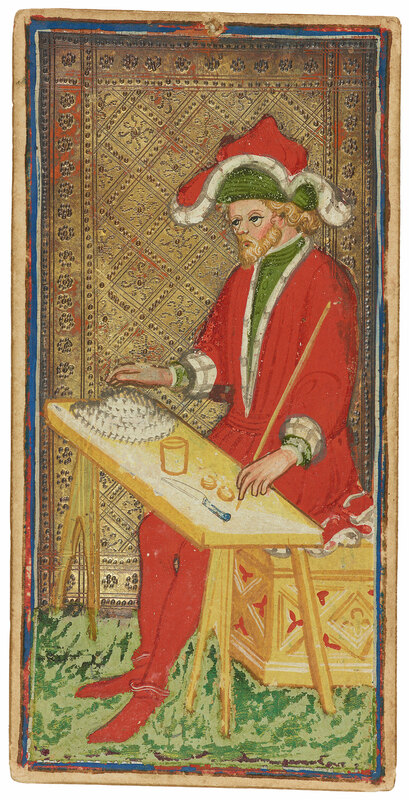 A complete pack of tarot cards consists of seventy-eight cards; the thirty-five cards in the Pierpont Morgan Library, twenty-six in the Accademia Carrara in Bergamo, and thirteen owned by the Colleoni family of Bergamo form one of the most complete sets of 15th cent. painted tarot cards of Italian origin. Stored in late 14th-century French cuir bouilli casket, said to be from the Pères de la Merci de Toulouse, with arms on an escutcheon: an angel confronting a shield bearing a cross; casket decorated with scenes of chivalry: a lady showing her heart to a knight, and a knight accepting the heart and giving the lady a ring; the casket was purchased by J.P. Morgan (1867-1943) on 7 November 1919 from Léon Gruel, Paris. Latin captions on card 9; French inscription on cards 28, 29, and 34: A BON DROYT.